A short article which provides some basics on social psychology and risk. Dolphyn recently launched our new brand and website (www.dolphyn.com.au). This involved a change not only to our name, but also the focus of what we do, which is supporting people and organisations to better understand and deal with risk. We do this by developing and implementing programs where participants learn how people make decisions and judgments about risk. At Dolphyn, we believe that it’s knowing ‘Y’ that matters. When we focus our attention and effort on supporting people to better understand ‘why’, they will have a better chance of being able to do what we would like them to do because they may learn about a particular matter or process rather than simply repeating or regurgitating what you have told them. ‘Knowledge’ and ‘knowing Y’ though, are complex subjects. In my experience, particularly in the risk and safety industry, they are often not well understood or considered. There seems to be little time in risk and safety to think about ‘knowledge’ and I hope through this Blog, and Dolphyn’s renewed focus on this topic, that we can slowly work on changing this. I’ve observed already that ‘knowledge’ is a complex topic, so we can start exploring it by looking at a definition. This means that knowledge is not just about remembering numbers, quotes and citations (facts), it is not just about intelligence and awareness of ‘stuff” (something), it is also that familiarity, awareness and so importantly an understanding of ‘someone’ (people). Knowledge is as much about understanding people than it is about having an understanding of facts, objects and things. Of course, this is just the tip of the iceberg in understanding knowledge. Through my studies in social psychology, I’m learning so much more about ‘Epistemology’ which is the study and exploration behind the philosophy of ‘knowledge’. This Blog, and my limited knowledge, doesn’t allow for any commentary on epistemology, however, it is something that I am learning to understand better and recognize the importance of. So what has this to do with how we deal with risk and safety? Why is it important to understand that it’s knowing ‘Y’ that matters? As I’ve noted above, on the whole I believe that knowledge is something that is not well understood in the risk and safety industry. I regularly see very simplified definitions of what ‘knowledge’ means and how it should be applied in our industry. It is worth pausing for a moment to consider this further. One example is the recently (2012) introduced concept of ‘Due Diligence’ in Health and Safety law in some States of Australia . The laws state that there are six ways that organisations and key people (‘Officers’) can demonstrate ‘Due Diligence’. One of those is to “Acquire and keep up to date knowledge of WHS”. So let’s explore what this really means? If we look to the website for the NSW regulator (see – (WorkCover NSW Due Diligence Guide) we see is that they outline these six steps and provide some (minimal) guidance on what each of the six steps means and how people can actually demonstrate them. There are the key steps that WorkCover describe as examples of how to keep up to date with ‘knowledge’ on WHS matters include. Each of the five points are about facts, objects, law and publications. Not one mention of ‘knowing’ people or anything about them! Safe Work Australia (SWA) in their SWA Interpretative Guide explain that ‘knowledge’ means ‘knowing’ “what the WHS Act requires and the strategies and processes for elimination or minimisation of hazards and risks so far as is reasonably practicable”. Again, the focus is on law, objects, hazards and nothing about people. Even where SWA do attempt to mention people (SWA Presentation) they do this in the context of people being part of a system. People are not objects that should be considered part of a system. People think, they feel and they make decisions and judgments. We are all different in so many ways. When we try to fit people into the construct of a system, these factors (thinking, feeling and decisions) are often not considered as we attempt to simplify and control how people behave. Enough of that for now, that’s the topic for another post. Firstly, recognise that having ‘knowledge’ of people is not possible without first having relationship with a person. In order to ‘become familiar’, ‘be aware of’ and ‘understand’ people, we need to have effective conversations. We need to listen to them by asking good open questions, and we need to suspend our own agenda in order to better ‘know’ more about the other person. We also need to be aware of, recognise and understand heuristics and biases and the role that these play in decision making. Without understanding that people have biases, we can be quick to jump to conclusions about them and give us a false sense of ‘knowledge’ about them. We need to know more about ourselves so we can learn about others. One way to do this is to understand Personality Type (see – Dolphyn Services – MBTI) and understanding more about how different ‘types’ of people act and gain their energy in different ways. A final tip is that we need to be aware that people have ‘bounded rationality’ (you can read more about this here – Dolphyn Blog – Flooding) and that ‘flooding’ people with information is one of the greatest causes of incident because they become distracted with so much detail. We need to think about how people ‘sift’ through all of the information that is provided to them and consider how they ‘discern’ what knowledge is valuable and what is not? These are just a few tips and areas that you might like to explore. The subject of ‘knowledge’ is detailed and complex. My concern is that if we stick with the simplified approaches to ‘knowledge’ that are currently adopted in risk and safety, that we will continue to focus on objects, laws and process and not understand people any better. So ‘knowing’ is more than just objects, laws and science. It is about people. At Dolphyn we are intrigued about ‘knowledge’ and we continue our quest to learn more about it. We enjoy helping organisations understand that It’s knowing why that matters, and we hope you enjoy us sharing this story with you. 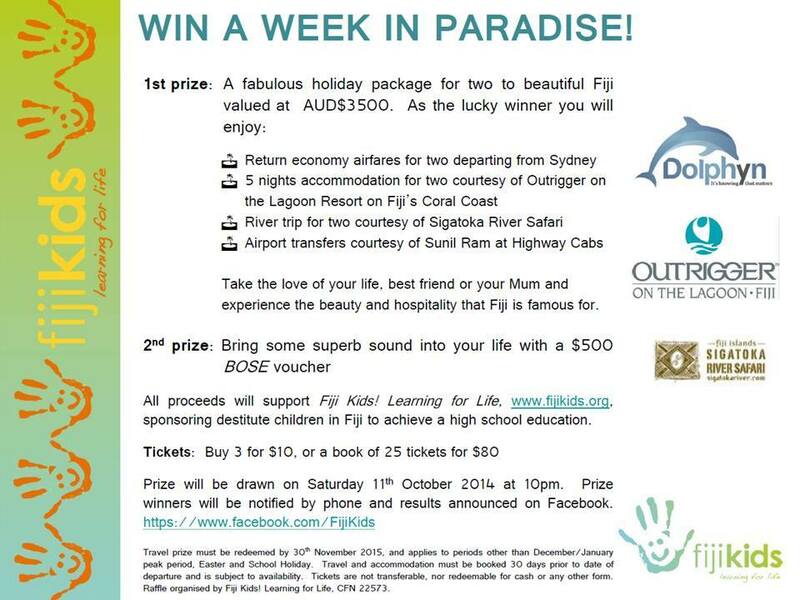 Dolphyn is proud to be associated with Julie and the team at Fiji Kids. Saturday 11 October marks the date for the Fiji Kids annual fundraising trivia evening. All proceeds go toward supporting kids in Fiji who would not otherwise be provided with an education which can change their lives. Details of the fundraiser are included in the flyer below. If you’re free on October 11, why not come along and support kids in Fiji to have a better education. I have spoken with a number of Managers over the past few months who have argued with me that ‘safety’ in our workplaces means that we must do everything we can to control people so that they do not hurt themselves at work. These people have said to me, “we can’t let dangerous things go untouched”; “we can’t let people make choices that may lead to them being injured” and “doing everything that is reasonably practical means that we have to have systems, and people have to follow them”. If this is what ‘safety’ is all about, I’m just not that into it anymore. If being ‘safe’ is all about controlling people in our workplaces, we need to be aware of the trade offs for controlling people’s behaviour and actions. We need to be aware that this stifles learning, and is demotivating for people who no longer have control over the decisions they make. The need to control and fix people also creates relationships that are rigid, yet we want flexibility and mature judgment. The more we seek to control others the less we create ownership, and the more we create co-dependence and as we know co-dependence is a mental health disorder. The truth is that as we become rule focused, we shift away from empathy and become focused on compliance. Those who are attracted to compliance, rigidity and control tend not to be able to create wholesome relationships based on mutual respect and understanding. Instead, controllers ‘command’ others, ‘dictate’ to others and rarely listen. Anyone who treats another as an object will only use and abuse others and will never be respected in a mutual way. So why is it that ‘safety’ has turned into an industry that is about control, rules, and process and less about people? When I started in ‘safety’ in 1993, my motivation was pretty clear, I wanted to work in an industry that was all about people. But ‘safety’ seems to have changed over the years. Being in ‘safety’ now is often seen as being the ‘fun police’. So often people in safety are forced into policing and inspection roles, asked to report to management on violations and non-conformances. They are often asked to report on ‘safety numbers’ and trends. Then, when they provide this information, there is usually much debate and discussion about definitions of things like incidents and frequency rates. I know that these things frustrate many of my friends and colleagues in ‘safety’. I find this sad and disappointing, but I’m not surprised. It is hard when you are in a traditional ‘safety’ role to get away from the rigour of systems, process and control. It is expected of you, and even when you second-guess the value of this approach, it’s often easier to continue, than to try to break the nexus and change thinking. So how do people in ‘safety’ deal with these frustrations and concerns? My friend who wrote to me, enjoys our regular catch up’s every few months where we share ideas, experiences and feelings. When they express frustrations and concerns, I don’t feel the urge or need to ‘fix them’, I don’t have to provide solutions. I just listen and ask questions that help them think through options , they need to decide what works best. For me, this is what being a friend is about, I demonstrate that I care without having to solve their problem. So sharing your thoughts with a friend who will listen, rather then solve, can be a great way to work through frustrations and concerns. Another thing I have found to help is that, along with a number of other friends and colleagues, we’ve formed what we call a ‘Thinking Group’. A small group of us get together every 6-8 weeks and allow ourselves time to ‘think’. During these catch up’s we don’t solve problems, we don’t develop new procedures and we don’t review trends. We just pick a topic or two, and without any specific agenda, we share our thinking. This is a great way to step outside the busyness of everyday life, and away from the constant control and process of our ‘day jobs’, and use our imaginations. I find that these are two great ways that help with deal with frustrations and concerns. So if you can ways to work through your frustrations, what might you be able to do differently to change the way that your organisation sees ‘safety’ and limit your frustrations and concerns? For a start, one of the methods that I have adopted is that I no longer tell people that I work in ‘safety’. I don’t want people to think that I’m interested in controlling people, policing people and reporting violations. I don’t want people to conjure up an image that I like to walk around with a checklist telling people what they are doing wrong. I don’t believe this is how you improve safety. Instead, I tell people that I enjoy learning about how people make decisions & judgments. My work is to share this learning and help people to discern risk themselves, not for me to do it for them. My work is to coach people and ask questions, not to control them, so that they can realise themselves that they may be in danger. My job is to motivate people by providing good information in a way that helps them learn, not just nod and understand, which is typical of how ‘safety’ training is often done. My job is to value people, their views and opinions. This often involves me helping them to think clearly. Sure there are procedures, risk assessments, investigations, however all this is done thinking first about the people who are going to be involved, not just what the law says. My jobs is let to people have control of their own decisions. I wonder, if you are one of those people like my friend, who are frustrated with how ‘safety’ is viewed, whether you might be able to change the way that you go about your job? If you switched controlling to supporting, would people view you differently? I’d love it if the next time my friend goes to a party that people would appreciate what they do and, even thank them, rather then alienate them. For me though, I’m just not that into safety anymore. Safety Culture to go…… Delivering results now! Organisations interested in cultural change need to think about, and understand their existing culture, then work hard over time to move toward a culture that they desire. Organisations can easily be seduced into ‘change programs’ that promise a lot in a short period of time, but fail to deliver because the organisation and its leaders are not prepared for the work and time required to achieve change. If it is a quick fix you are after, you are probably more concerned about ‘climate’ than ‘culture’ (more on this later). This was certainly the case when I was talking to someone recently who very proudly told me about their ‘organisational change programs’. They said “our programs are remarkable! They are fast paced, interactive and get everyone engaged.” By this point I was already starting to tune out of the conversation, though I suspect that their slick and charismatic style would appeal to many. The cracker though was when they told me; “our programs are so good that we turn organisational culture around in two days. Our clients are always happy with our results and we never fail to impress” They continued, (mainly because I could not stop them! ), “in one recent program we had guys who were previously shouting and fighting with each other at work that, by the end of our program, were joking around and having fun together. That’s just the effect we have on people”. Well by now, I had completely switched off but I’m not sure they noticed. All they were concerned with was boasting about their magical programs that, as they put it, “turned carcases into fighting animals”. Whatever that means? I was sharing this story with some colleagues recently and we were so impressed with the business model and particularly the results, that we got to thinking about how we might be able to develop a similar business. We brainstormed for a short while and quickly came up with our business name, “Safety Culture to Go”. Within twenty minutes we had our business plan set. We decided that we would target organisations that want change fast, that want results now, and that really want to engage their teams. The operations model we decided on was ‘drive through culture stations’. We’d place the stations around the country so organisations could simply arrange for their people to drive through, get a taste of culture and wham, there you have it, culture change would occur. For organisations wanting significant change, of course they could go for our ‘upsize’ service. At Culture to Go, we put the ‘cult’ in Culture……. Sadly, I suspect that there are some people and organisations out there that would think this was firstly appealing, and secondly, could work! Of course organisations who are genuinely interested in cultural change know that it is hard work, it is not something done quickly and it certainly isn’t something that should be left to a smooth talking salesperson to drive in your organisation. Staff surveys conducted where people are asked to answer leading questions and given plenty of time to consider and evaluate their answers before responding. https://dolphyn.com.au/wp-content/uploads/2014/08/maccas-drive-thru_thumb.jpg 319 412 BYBO Webmaster https://dolphyn.com.au/wp-content/uploads/2016/11/Dolphyn-logo-v2-334px-150px.png BYBO Webmaster2014-08-11 11:03:592014-09-06 08:50:06Safety Culture to go…… Delivering results now! I was recently talking with someone in the childcare industry who shared their experiences about health and safety, in particular risk assessments. They were frustrated, so much paperwork, bureaucracy and time spent on a process that seemed to be all about covering backsides. I hear the same thing all the time, people frustrated with safety, and I wonder whether risk assessment has become a ‘tick and flick’ exercise or an activity aimed at improving safety? Risk assessment became a buzz term in health and safety with the introduction of ‘performance based’ legislation (e.g. OH&S Act in 1983 in NSW). On one hand it created a more flexible approach to health and safety, on the other, frustration for employers who just wanted to be told what’s “right or wrong”. Introducing the requirement for ‘risk assessments’ or ‘risk management processes’ was a way of self-regulating health and safety in industry. When asked questions like the one from the person in childcare, it makes me wonder whether our current approach to “risk assessment” and “risk management” is really meeting with the intent of the law, or have we become obsessed with creating paper trails? When I talk to people about risk assessment, the focus is often on getting the paperwork done, often copied and pasted from the last task/job/project. There is even a page on popular social media site LinkedIn (http://www.linkedin.com/groups?gid=3750030&trk=my_groups-b-grp-v), and there are many others, where you can share ‘risk assessments’ and other similar safety documents. I have also observed that most risk assessment methodology is objective, and there is very little understanding and consideration of how people make decisions and judgements, which is so subjective. More on this later. inspections looking for things like safety glass, gates at the tops of the stairs and locked cupboards for chemicals, medicines and the like. I thought, all pretty standard and not surprising. I’m sure they could do things a little differently, but pretty typical of safety controls in today’s litigious environment. Then we started to talk about excursions, taking the kids down to the local park so they can get some fresh air, run around like kids love to do and play on the swings. A great idea right, the kids will love it, they might even learn while having fun. Of course first, you must do your risk assessment, you know the drill. How can you think of all the potential hazards when you take a couple of kids to the park? – e.g. will that tree branch fall off today? It looks pretty safe? How can you rank risks using a matrix that requires you to consider the likelihood of that branch falling off a tree? You’re in childcare, not an Arborist! If that branch falls, will it land on the child’s arm, leg or head? e.g. – what will the consequence be, a cut, head injury, bruise? As noted above, the other thing that is missing in this typical ‘risk assessment process’ is that there is often no consideration of how people make judgements and decisions. Through our studies in psychology and social psychology (for example see Daniel Kahneman’s Thinking Fast and Slow – 2011), we know that most of our thinking is not done in the rational and conscious mind, it is done in the sub-conscious. We develop heuristics to help us get through most our daily life and routine. Dr Robert Long in his book Risk Makes Sense (2012) (http://www.humandymensions.com/books) refers to Heuristics as “experience-based techniques for problem solving, learning and discovery. Heuristics are mental short cuts used to speed up the process of finding a satisfactory solution, where an exhaustive search is impractical. Heuristics tend to become internal micro-rules”. Think about when you are driving your car, you don’t “think” in your conscious mind when the brake light on the car in front comes on. You develop a Heuristic soon after you learn to drive that tells you “automatically” that you need to put your foot on the brake in your car. If we had to process this decision in our rational and conscious mind, we would be sitting in the back seat of the car in front before we could make a decision to respond! If we look in detail at just one example of a Heuristic, there are many, and how it applies to safety, let’s consider the “availability heuristic”. This is where our brain “thinks” that something may be a greater risk just because a story is more familiar to us. For example, in this video (http://www.youtube.com/watch?v=2_wkv1Gx2vM) the question is asked about what animal causes more deaths in the USA, horses or sharks. Most people may think sharks due to the number of dramatic news reports about shark deaths. However, because stories about deaths involving horses may not make national news bulletins, it is likely that this information won’t be as ‘available’ to people as shark deaths, hence that are likely to think Sharks. The “Availability Heuristic” comes into play because our mind will have a bias to go to whatever answer is easier and quicker, in this case sharks appears easiest because we hear of deaths involving sharks so often. Since we do most of our thinking in the sub-conscious and heuristics drive a lot of what we do, I wonder whether there is any value at in the current method of doing a “risk assessment”. The typical process is that we gather a group of people, we work through the steps of the job/task/process then we come up with potential hazards. Because our conscious and rational mind doesn’t like doing a lot of work, we come up with hazards and their risks based on our heuristics. How can we really think that we have come up with an exhaustive list of hazards when we know that our brain doesn’t function like that? It is always looking for the shortest and quickest way to get to a solution. This has dangerous ramifications if we use this as our only method to understand risks at work. We must realise that the results of our ‘risk assessment’ are so limited because of this. There must be a better way, and of course there is. If we have more conversations about hazards and risks, rather then telling, would our processes become more about sharing information and learning rather than policing? If our conversations were meaningful during safety assessments, would everyone feel a part of “noticing that”? I think there is a lot we can learn from these examples in the childcare industry. In your work environment, is risk assessment about ‘tick and flick”? Is paperwork more important than effective conversations and learning? Do you focus on objects more than people? Do you know about, and consider, Heuristics as part of your risk assessment process? There will be those people who say, but we need the paperwork, otherwise how will we prove what we have done. I don’t suggest that we need to do away with paperwork, I say just don’t rely on paperwork. For those people working in fear of the legal fraternity who say things like “if there is no written record, it wasn’t done”, you can be sure the first thing a good lawyer will do if the matter ended up in court is to find a way to discredit what you have written, and find out how things were really done! Keep your paperwork, just make it simple. Spend more time conversing than writing! Maybe we should think about “risk assessment” as being another way to engage people in more conversations, where they become more conscious of the hazards and risks that they face. Do you think this would create safer workplaces rather than reams of paper that are created to cover backsides?